Dual-energy CT (DECT) is an important application of CBCT. DECT gains diagnostic information on tissue composition and facilities rapid and accurate diagnosis. A generic problem of DECT, however, is that the decomposition process is unstable in the sense that the magnitude of true decomposed signals is significantly reduced due to signal cancellation while the image noise accumulates from the two initial CT images of independent scans. A direct image decomposition, therefore, leads to severe degradation of signal-to-noise ratio (SNR) on the resultant images. Previous noise suppression techniques typically implement the procedures of reconstruction and decomposition sequentially. The problem of noise boost is alleviated by standard noise suppression algorithms at the cost of reduced spatial resolution. In this work, we propose a different method that combines the reconstruction and decomposition of DECT, such that the decomposition step is carried out iteratively. The noise on the two initial CT images from separate scans becomes well correlated, which avoids noise accumulation during the decomposition process. 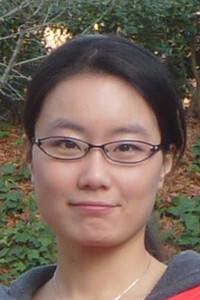 Xue Dong is currently a forth-year PHD student in Nuclear and Radiological Engineering and Medical Physics Programs, working with Dr. Lei Zhu. She got the B.Sc in Mechanical Engineering from Dalian University of Technology, China in 2010, and M.Sc in Medical Physics from Georgia Tech in 2012.